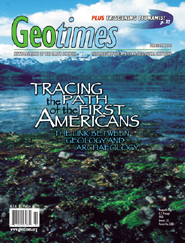 Geologists are exploring North America's glacial history to retrace the steps of the first Americans. The search for early Americans is taking researchers to the coast of British Columbia, where a now-submerged landscape may hold clues to the first settlers' coastal migration. From soil in Kansas to sediments at the bottom of the Black Sea, geoarchaeologists are exploring the landscapes that have shaped civilization. In Texas, a group of geoscientists is fighting to restore earth science to the core curriculum of the state's high schools. NASA's new mission to the Moon and Mars could have significant implications for its mission here on Earth. At learning centers across the country, students are zooming to Mars and beyond while keeping alive the memory of the Challenger and Columbia disasters. PowerPoint can reduce good data to meaningless fluff. Geochemical data are revealing a potential new role for coal in pre-Colombian Peru. Early Americans may have first migrated to the continent on boats along the Queen Charlotte Islands region off the coast of British Columbia, Canada, until a warming period about 10,000 years ago. That warming would have contributed to the severing of the islands from the Canadian mainland. Research suggests that marine habitats for the area about 10,000 years ago were very similar to those of today, shown here. This photo of southern Graham Island in Queen Charlotte Islands is by R.I. Thompson. 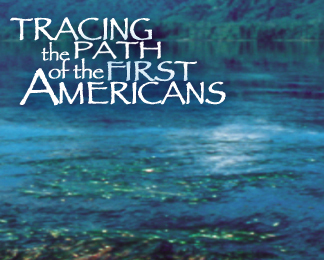 Find out more about the progression of thinking on human migrations in "The Ice-Free Corridor Revisited" and "Quest for the Lost Land."